Frostfell is active on Test! There’s plenty of Frostfell cheer throughout Norrath this season! Gigglegibbers and Frostfell elves are busy celebrating the holiday within the player cities, and encouraging everyone to visit the Frostfell Wonderland Village, accessed through the Magic Closets in Qeynos Province District, Freeport, Haven, Kelethin, Neriak, Gorowyn and New Halas. There you can assist Candice Cheriweth, Gardy Ex-Giftgiver, Mr. McScroogle, Queen Bunny, and Snarf Frostfoot with some holiday tasks, but only after you release them from their deep freeze! For those that have a talent for crafting, you can help Sogs Frostfoot, or gather presents to craft wondrous new Frostfell goodies for yourself. Don’t forget to log in each day and claim your extra-special Frostfell present from everyone’s favorite Frostfell Gigglegibber, Santa Glug! This event content is currently set to run 12/12/13 at 8am PST* through 01/09/14 at 7am PST* on the live servers. It has been many years since the moon Luclin mysteriously exploded, sending debris crashing to Norrath. The catastrophic damage split the surface of the planet into the divided islands now known as the “Shattered Lands.” Despite the near-destruction of their homelands, the survivors of the Shattering and their descendants went on to accomplish great deeds, and all Norrathians celebrate their triumph at the annual Heroes’ Festival. New for 2013: Earn Tokens of Heroism as you participate in the festivities and trade them for brand new rewards. Complete all the quests to get the “Badge of Heroics” achievement! As one door closes, another opens. While we’re in the final week of the Nights of the Dead celebrations (the event concludes when Tears of Veeshan goes live on Tuesday, November 12th), we’re already looking ahead to the Heroes Festival which this year has new rewards, quests, and a new achievement. While the Heroes Festival event will run from Friday, November 15th until Monday, November 25th, you can test it now by logging into the Beta server! The Heroes’ Festival has begun! A call has gone out to all Norrathian adventurers to commemorate the years of questing, raiding, tradeskilling, house decorating and socializing. Celebrators, happy to share in the festivities, can be found in the cities of Qeynos or Freeport. Sigrdrifa is also feverishly updating EQ2 Wikia’s Tinkerfest guide for 2013. Get ready for our 67th game update, Darkness Dawns, with a Double Experience Weekend! Adventure, Tradeskill, AA, and Guild XP will be doubled from 12:00pm (Noon) PDT on Friday, July 19 through 11:59pm (Midnight) PDT on Sunday, July 21, 2013. Take advantage of this limited time offer and watch those XP bars fill up! Double XP Weekend — April 26 ~ 28 — Guild XP Too! Get ready for next Tuesday’s launch of Game Update 66: Scars of the Awakened with a Double Experience Weekend! Adventure, Tradeskill, AA, and Guild XP will be doubled from 12:00pm (Noon) Pacific* on Friday, April 26th through 11:59pm (Midnight) Pacific* on Sunday, April 28th. Jesters, thieves, bards and fans of mischief are invited to enjoy the adventuring and new crafting festivities that surround Bristlebane Day! You never know what riddles, laughs and pranks are to be found during this enjoyable time of year. Celebrators are present in every home city, and the oddest of objects have been spotted in Antonica, The Commonlands, Darklight Wood, Timorous Deep, Greater Faydark and Frostfang Sea! 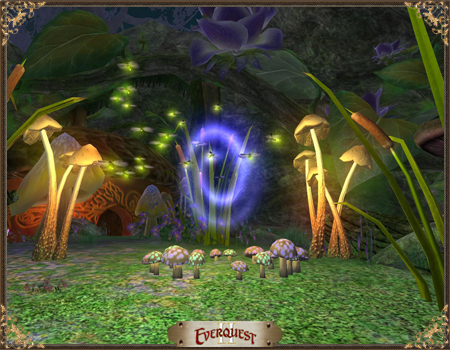 Be sure to keep your eyes peeled for special events, especially in Enchanted Lands, occurring only on the Highest of Silly Days, April 1st, 2013! New beasts – Beastlords have the chance of finding a rare creature in a multitude of overlands during the weekend (3/29 – 4/1), for their taming pleasure! New Tradeskill recipe book, “[eq2u]Perfectly Serious Items to Craft IV[/eq2u]”. The recipes require holiday harvestables gathered from “Jester’s gardens” and other low level harvestables as components. As always, EQ2 Fan Sites are on the ball with the latest information about this event with complete quest writeups and screenshots of the new craftables and quest rewards! EQ2 Zam: The Joke is on Norrath.. Bristlebane Day Returns! EQ2Traders: Bristlebane Day: Size Matters! From 12:01 a.m. Thursday, March 21st, through 11:59 p.m. Thursday, March 28th, log in to EQII and take part in a look back at Norrathian days of yore. The EQII Team has created this fun event as an homage to EverQuest in honor of the anniversary of the EverQuest franchise, and although the lore doesn’t exactly fit the current story of EQII, they decided to make it extra enjoyable for those who were around for the first iteration of Norrath. Adventurers who take part in this journey through time will find some silly nods to EQ and moments of nostalgia as we reminisce about our heritage. This year’s event sees new rewards including equipment (the old stuff was great when the event started, but has been getting a bit long in the tooth), as well as some great EQ paintings. Zam is on the ball and has completely updated their Chronoportals section with all the new info, quests, and rewards from this event for 2013. UPDATE: It looks like our report of new equipment was erroneous. On the 20th day of every month, the grottoes of Norrath open for a short time providing players an opportunity to acquire unique house items. Although it was always intended that they would be expanded, the Moonlight Enchantments have experienced few changes since their inception — until now. This month’s event sees additional house plants and sundry items including the oft-requested “Water Tile”, all told 19 new items. Tip of the hat to Kinya of the Polish EQ2 fan site Babagra for sending me the first screenshots of these items. Niami Denmother has also updated EQ2Traders with a writeup of the revised event. And EQ2 Zam has the new information as well under each vendor. Thus far, other sites we checked out are still showing outdated information. By the way, not everyone is enamored with the fog and other effects on the Water Tile. The EQ2 team are working to eliminate these effects so the effect is more realistic when these tiles are used in larger quantities to simulate a water feature, moat, etc. This is in addition to other tweets that we might see other additions to this monthly event. Many moons ago, the Dwarves started Brewday in honor of Brell. Now, each year, portals appear in Antonica, Commonlands, Haven, Greater Faydark, Timorous Deep, and Frostfang Sea to lead you to the Bar of Brell, where new and classic adventures await those thirsty and foolhardy enough to enter! Otengard Brauer has also set up a Beer Garden in the Butcherblock Mountains, but the ale seems to have attracted some goblins. Help him while competing against others in an effort to rid the area of the most goblins. And as you’re crawling through the bars and drinking holes throughout Norrath, be sure to keep your eyes peeled for special items of interest to collect! Brewday begins on March 7th, 2013 at 12:01 am 1:40am Pacific Time and runs until March 18, 2013 at 11:59 pm Pacific. Last year on March 10, and in the week before that date, Norrathians made gaming history. 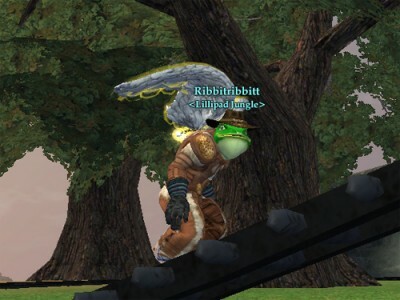 Over 600 unique accounts came together from servers across Norrath for one purpose: To give a very special little Froglok some wonderful playgrounds and a very special party in his honor. For those of you who weren’t involved, we started a guild and leveled it to 70 for a [Tier 3] guild hall in less than 70 hours. We not only decorated Ribbitribbitt’s TT Island Retreat but 3 other prestige houses were donated and the T3 hall still looks spectacular. So many of you told me stories in the days and months that followed of fellow adventurers that you had lost and of whom you had fond memories. I myself have lost a few friends along the way. This year we want to remember the feeling of community that we gained that day. We want to celebrate not only Ribbitribbitt, but all the friends we have lost along our adventures. And we want to celebrate the friendships we have made that are still going strong. Myrose, Ribbitribbitt’s mother, and I would like to invite you to this celebration. Last year we announced our partnership with Wikia to deliver players a unified, community-driven resource. For several months we’ve been working on developing even more wikis for our most popular games. Come join us as we’ll be showcasing our official Wikia sites for PlanetSide 2, Wizardry Online, EverQuest II, and the newly-added Vanguard. We’ll also be chatting about the benefits of the wikis, how you can get involved, and more wikis that are on the way. So come join us on Thursday, March 7, 2013 at 4:00 PM PST on Twitch TV for our very first Wikia webcast! Your host will be Linda “Brasse” Carlson (Global Director of Community Relations), joined by Tiffany “Amnerys” Spence (Community Manager), Colette “Dexella” Murphy (Community Manager), and Jennifer “Yaviey” Bridges (Wiki Project Manager). Let’s collaborate! 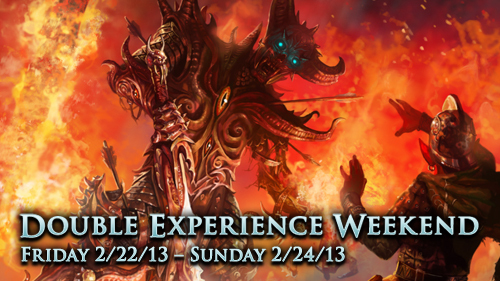 We are running a Double Guild XP Weekend starting tomorrow at noon PST until Sunday, March 3 at 11:59pm PST. Double XP applies to Adventure, Quest, and Tradeskill XP. No Double XP for Guilds this time. Double XP Weekend started last night promptly at Midnight (Pacific time) and will run through Tuesday, January 1st @ 11:59pm PST (that’s Wednesday, January 2nd @ 7:59 GMT). Now that the Group XP penalty is gone and you get as much XP with 6 people in the group as you do solo, will you be leveling different this weekend? How many levels / AAs are you planning to get? After I get the last of my alts to 95, I’ve got a 35 mystic with 180 AAs that I’ll be working on. Since mercs still take half your XP, will you be using them this weekend, or trying to get in groups? It will be interesting to see what zones people try out. No doubt Skyshrine will be overstuffed to the gills with people scrounging for every last mob, as no doubt will Kingdom of Sky contested zones. Is all of this XP grinding really necessary or is it time, as Dellmon of EQ2Talk has mentioned several times, for an Instant Level 90 button (for alts)? 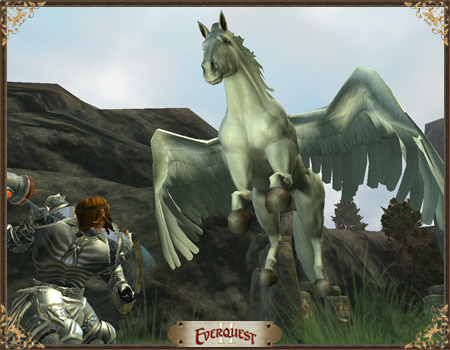 Ring in 2013 with Double Experience in EverQuest II! Starting Sunday, December 30, 2012 @ 12:01am PST until Tuesday, January 1, 2013 @ 11:59pm PST, we’re offering Double Experience in EverQuest II! Take advantage of this limited time offer and watch those XP bars fill up! Our understanding is that this will affect Adventure XP, AA XP, and Tradeskill XP, but probably not Guild XP. We’ll update if we get clarification on this! The maximum number of different resources that you can store in a Guild Harvest Depot has been increased from 200 to 1000. Several new Depots have been added as guild amenities! Check the “Depot” tab in your guildhall amenity list for details. The maximum number of items in a single depot stack has been increased from 20,000 to 99,999. Set Access now works with storage containers for the purpose of withdrawing items from the containers. Deposit remains open to all. Storage containers will now show the minimum level to use an item instead of the item level if there is one specified. You can now use the Deposit All button on depots to deposit every valid component from your bags. Whew! With a little over 12 hours to spare before Frostfell 2012 goes live, I finally have the Frostfell 2012 crafting preview done! I bet you folks didn’t think I’d have it done in time – I know I didn’t think I’d finish it before tomorrow! Fortunately, I had some phenomenal help from a pair of SOE Frostfell Elves with regards to most of the images, and I think I caught all the high points. Check out Niami Denmother’s Frostfell 2012 Preview! Chains of Eternity is EverQuest II’s 9th expansion! In Chains of Eternity, adventurers will travel to the realm known as Ethernere in their quest to stop the siphoning of souls from Norrath. Here, the heroes will fight to save not only the mortals of their world, but prevent the imbalance in Ethernere, as well as meet the God of the afterlife, Drinal, the Silver Reaper. They may yet find the answer lies not in fortunes and portents, but deep in Norrath’s past. Adventurers will also uncover all new areas in the mortal realm of Norrath. The fate of the living and the dead are in your hands, heroes! Are you up to the challenge before you? We’re extending Nights of the Dead until tomorrow night at midnight. We goofed and ended it at noon today (time is hard). Spooky tidings! Last weekend was so great, we decided to do it again! Starting at 12:01pm (noon) Pacific on Friday, November 2 , 2012, and lasting until 11:59pm Pacific on Sunday, November 4, 2012, we’re offering Double Experience in EverQuest II! Take advantage of this limited time offer and watch those XP bars fill up! REMEMBER: Each copy of the Chains of Eternity expansion will include two baubles which you can use to boost two level 90 characters to 280 AAs. So don’t fret about any level 90 characters that are short on AAs, instead work on lower level alts. The Troubling Truth – The Scarecrow King now has a reward chest for players level 91+.